Bethlehem Presbyterian Church was established in 1729-47 years before the Declaration of Independence. It is the third oldest Presbyterian Church in Orange County. The first Church building was constructed prior to 1731 (though the exact date is unknown). The first Parsonage was situated on a farm of 105 acres. It has been said the George Washington worshiped at Bethlehem sometime during his stay in this area, from 1782 to 1783. The first Church building was torn down in 1827. Little is known about this first building other than it had 31 pews on the main floor and 18 seats in the gallery. A second building was constructed in 1829 (this is the building currently in use), and the present-day Manse was built in 1837. To quote from the Church Directory of 1951: "Through the 220 years, Bethlehem Church has served God and its community. It has been, and with God's blessings will continue to be, a bulwark of strength to its people, a haven of refuge to the needy and sick, and a place of prayer and worship to all who find a need for the Lord's protective care and counsel. Here God has sustained and strengthened all supplicants, and within its four walls, and within the radiance of its benign influence, young and old alike have ever found solace and comfort." The first Church building was constructed prior to 1731, but the exact date is unclear. The original building was demolished in 1827 and the current Church was constructed in 1829 at a cost of $3,441.32 (the exact date of construction is listed as 1827 - 1830 in various documents. The church occupies the same plot as the original building except for a slight shift to ensure that the pulpit, beneath which one of the original pastors of the church is buried, sits on exactly the same spot. A picture of our sanctuary. In the forground is the table used for Holy Communion. 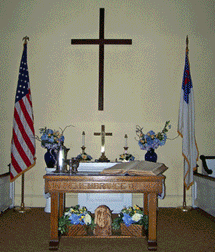 The pulpit is to the left and the choir sits to the right. The church library is housed in a building that originally housed a one-room schoolhouse for for District 7 of the Town of Cornwall school system. 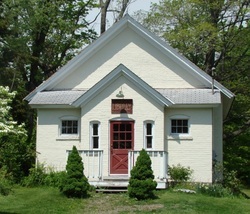 This schoolhouse was built in 1859 on a plot of parcel of land owned by the Church with the stipulation in the deed that if the school was ever closed, the property would be returned to the Church. Our fellowship hall (originally known as the community house was originally built in 1937 and in the years since. In its two stories it contains meeting and Sunday School areas, a kitchen, a gymnasium and a stage (where pagents and the Bethlehem Summer Music Festsival are presented). The bridge is one of the kids' favorite spots. Located next to the Fellowship Hall and leading to the Manse, the bridge is a wonderful place for quiet reflection.